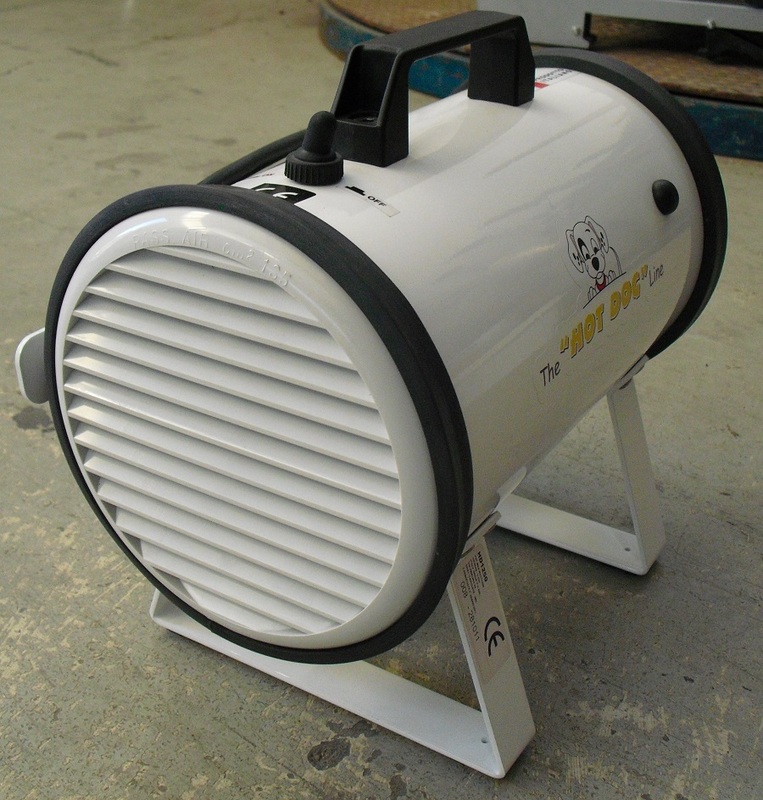 The pulsore hd 1250 is a white pulsore soundproof, heat-insulated, practical and indispensable, born from the need to have a highly professional portable. Thanks to his belt the pulsore hd 1250 white is in fact easily transportable and especially useful in in-home, at events and exhibitions. Summary of efficiency and convenience, the pulsore hd 1250 white mantiene high quality of its performance at a highly competitive price. Its compact and robust stainless steel, making it highly resistant to corrosion and can also be used in areas of high humidity. Through a jet of hot air aimed the pulsore hd 1250 white, facilitates the removal of water from undercoat so as to improve the later stage of drying the hair. Its air jet is produced by two electric motors without resistance which allows to generate a flow of air at a constant temperature, eliminating all possible sources of heat damaging to the hair and revolutionizing the drying system. 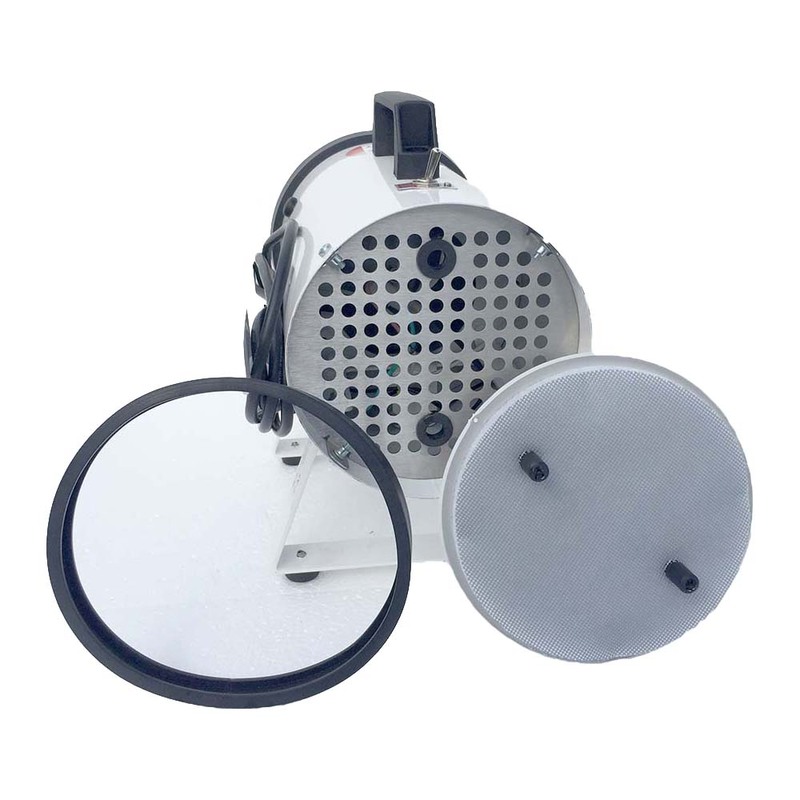 The motors are cooled by air from outside through an air inlet protected by a replaceable filter. 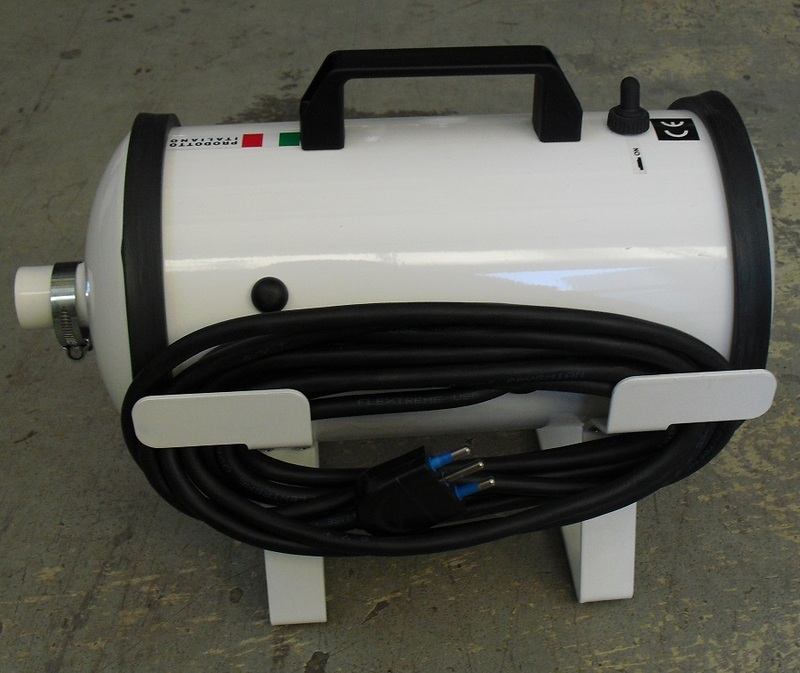 The pulsore hd 1250 white possesses a power regulator electronic (RE) that allows to determine the intensity of the air jet according to the working requirements or those of the animal. In this way we obtain a considerable energy saving to the benefit of costs.In the design stage, particular attention has been paid to the impact sound equipment that has been reduced considerably compared to previous versions and similar pulsori on the market, thanks to the use of specific materials of high quality.In addition, to meet the needs of space and convenience, have been reviewed the size, the weight and the use of the extendable tube so as to ensure that saves space and greater ease of use. 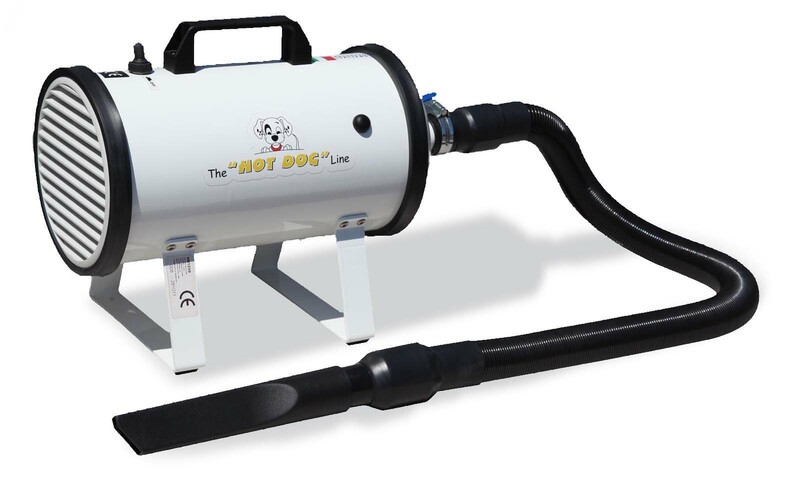 Thanks to its polyurethane tube resistant to high temperatures and hydrolysis, extensible and retractable power from 95 to 380 cm, the pulsore hot dog is practical and functional. The pulsore hd 1250 white can be portable or fixed, depending on whether one uses the shoulder strap or the fixing kit and is equipped with a series of accessories, such as brushes and spears of various measures, which facilitate the work and the results also the most difficult areas of the animal. 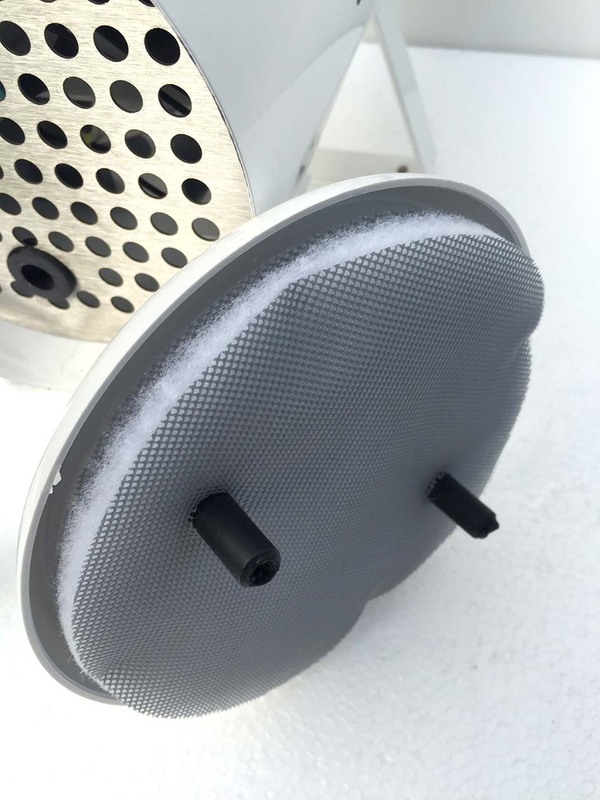 To ensure the optimal operation of pulsore, optimizing yield, performance and durability, we recommend to clean the filters regularly. The pulsore promptly removing water from the undercoat, reduces the possibility of loss of sebum, the natural skin protection, which would make the hair frizzy and smelly. Moreover, thanks to its air jet concentrate optimizes the drying times and is well tolerated by all the pet, as with the drive power can adjust the air flow according to the different needs. 1. Before drying the hair, dab the pet with a towel to try to absorb as much water as possible. We recommend that you do this in the tank to avoid wetting everywhere and risking slips! The ideal is to have a bearing surface in the vicinity of the tank and fix the pulsore in close proximity to this area, so as to proceed with drying in a practical and fast thanks to the extendable tube h and will facilitate every movement. 2. Begin to dry starting from a precise point and proceed in an orderly, in order to give the correct sequence to the work, and then optimize the results. If the dog is not used, do not set the expulsion of the maximum power, but increase gradually in order to accustom the animal to heat and air flow.